Edgy folk are defined by their openness to experiment and novelty of all kinds. This openness to meta-physical and material evolution crosses over to permaculture in a popular, transcendence-inducing topic called the edge effect. Simply put an edge is a junctional area between two ecological zones, which attracts bio diversity as these borderlands combine the qualities and species of the two zones that meet here, often leading to the evolution of micro climates and new species. 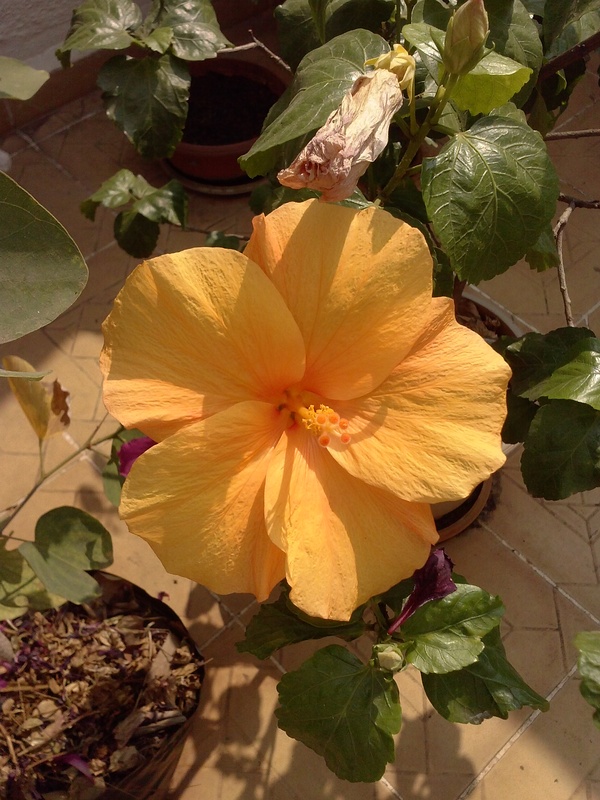 A particular plant becomes the object of our affection and takes over the garden. But this devotion can lead to monoculture, bringing with it an absence of variety that only pests love, jeopardising a garden’s eco-system. Monoculture imperils the organic method, even the semi-organic method that I follow. A devastating Indian summer this year produced a terrible drought in the hinterlands around Pune where I live. The unseasonably high temperatures brought a plague of mealybugs to my sky-high garden. 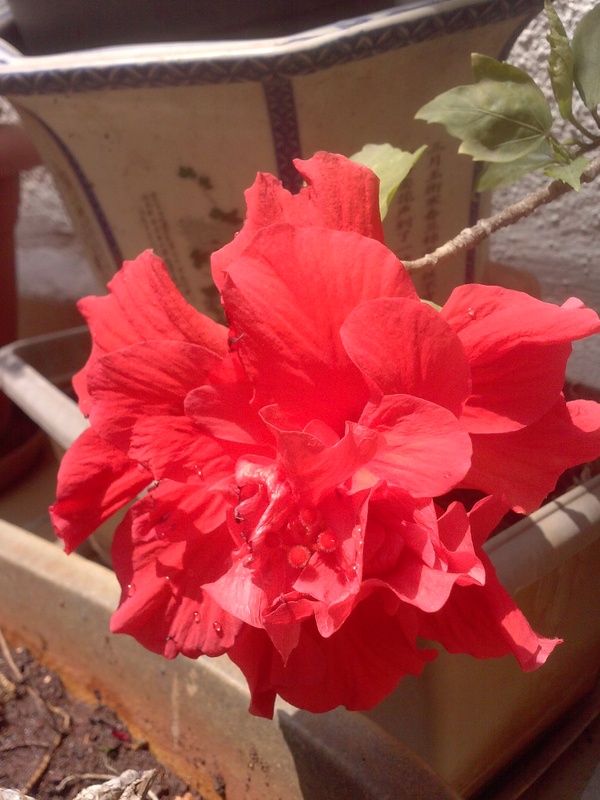 The cotton-covered, plump little voracious vampires never tired and they multiplied ceaselessly in the scalding summer heat and my garden’s hibiscus culture. On cooler summer mornings, the winged forms of a white pest, I once thought these were immature mealybugs, would take to the air flying off to parasitise yet more plants. Despite many thorough once-overs, brushing them off all reachable plant parts, they would reappear a few hours later relentlessly polka-dotting all those just-cleaned plants, irrevocably mutilating the leaves on which they fed. 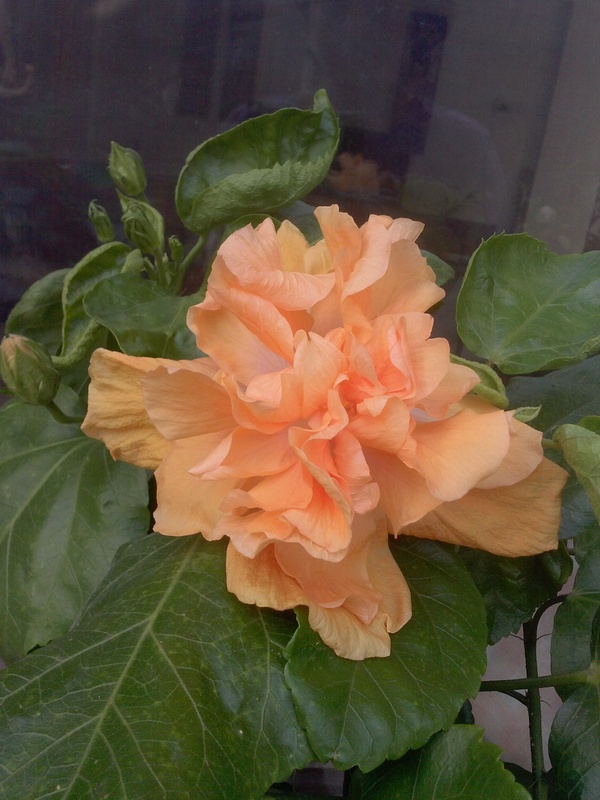 Orange-pink ruffly double is the resulting hybrid of (yellow-orange) hibiscus rosa-sinensis x (red) double hibiscus rosa-sinensis. Zooming in on the frosty pink colour in the centre of the flower in its eye zone. The pink rays out into the veins of the petals. 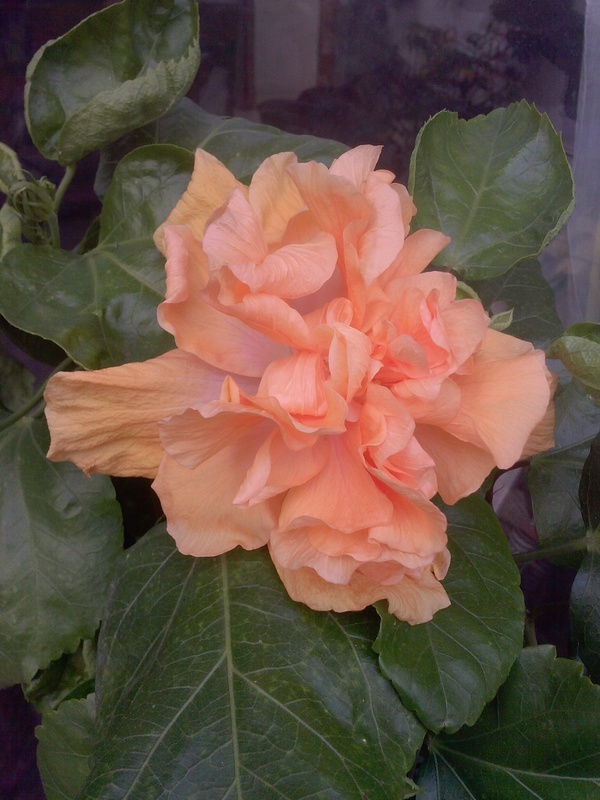 This seems to explain the undertone of pink in the flower’s dominant light orange colour. 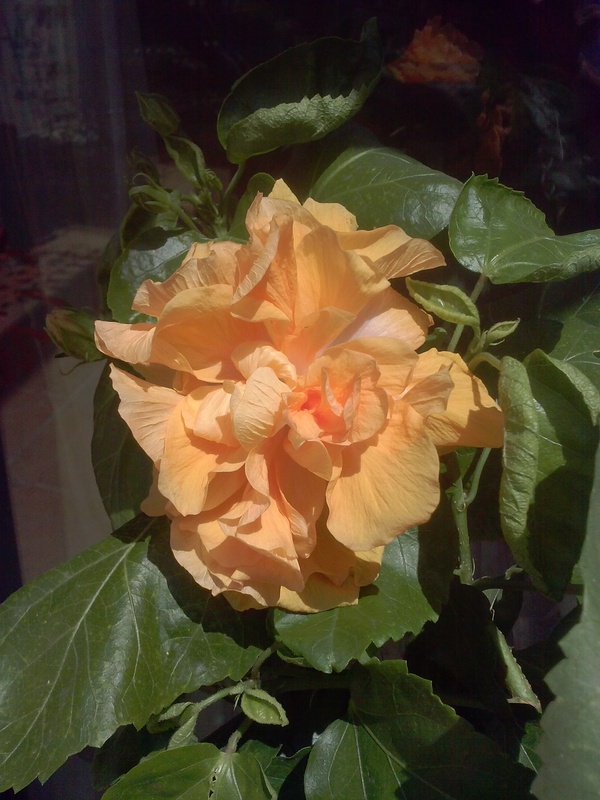 But a strange thing happens to this flower’s colour palette in sunlight. 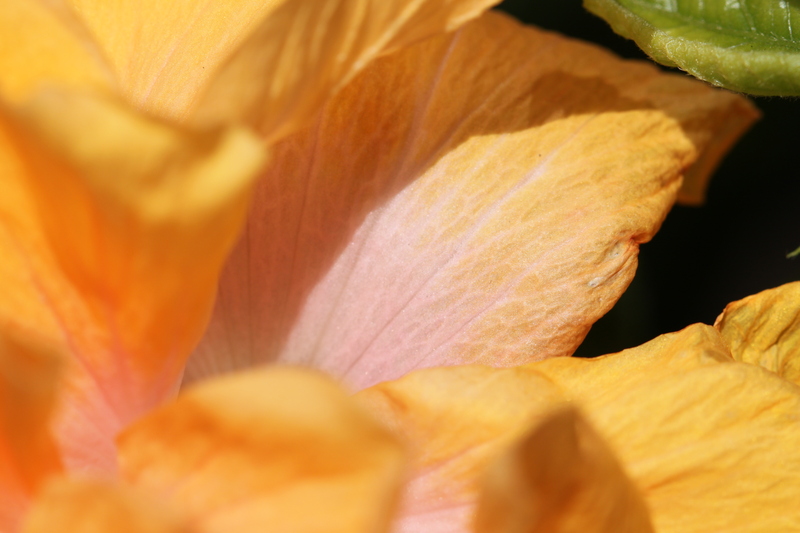 The flower petals, as in this pic, seem to reflect some of its pod parent’s yellow colours. Imagine this. His name was not Gregor. It was Johann, the name his parents had given him. The Mendels were farmers who wanted their son to take over their farm. But Johann Mendel was depressed because what he wanted from life his family could never understand. He was sensitive and liked the quiet. Left to himself in his own private world, he was free to ponder the mysteries hidden in his parents’ garden and the wider cultivated world of their farm. He read, studied and saw minute things in the plants that no one thought important enough to notice. To others he was strange, his interests and studies wasteful, costly and unprofitable. The strain of breaking away from the people he loved so much, the people who couldn’t understand him, proved too much. He had to break down and remake himself again to find his own path in life as a scientist. There were many informational signs up in the garden at one time. This was the only one I could find on my last visit. 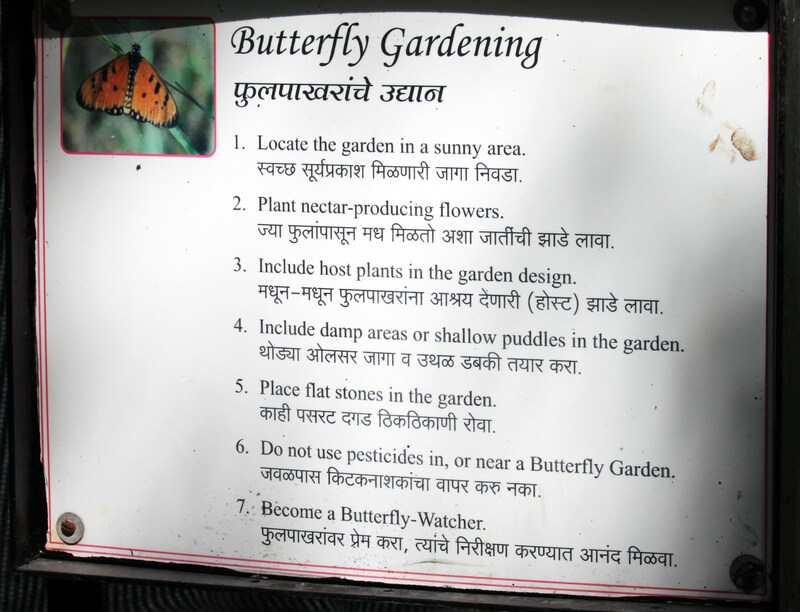 In the heart of my city Pune, unnoticed by many, butterflies congregate in a rundown little municipal garden. 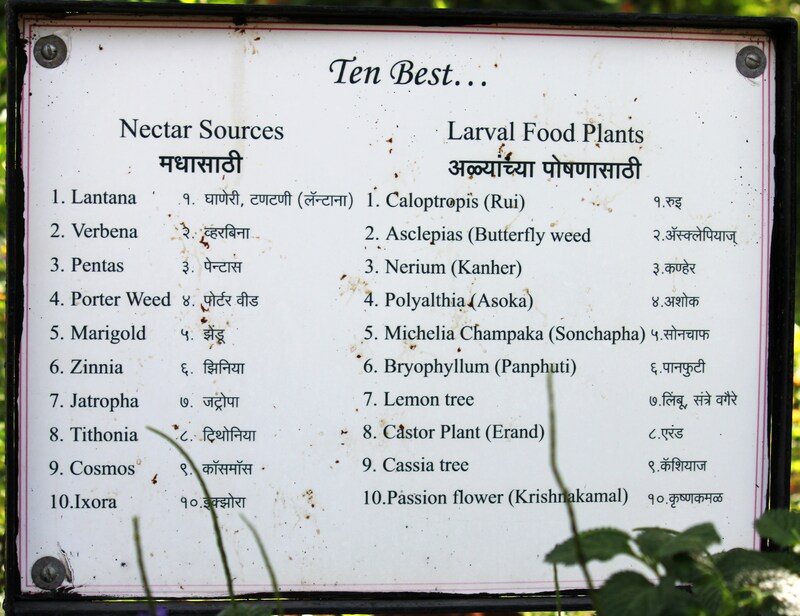 Like all things created by the city, the garden in Sahakar Nagar, fronted by bright green butterfly-wing gates announcing its purpose as an insect house, has fallen into disrepair. No one among the powers-that-be, focused narrowly on business opportunities, is interested in keeping a green idea going. Last month when we visited the garden, we found it had the appearance of a lost world Arthur Conan Doyle or Indiana Jones would likely visit. 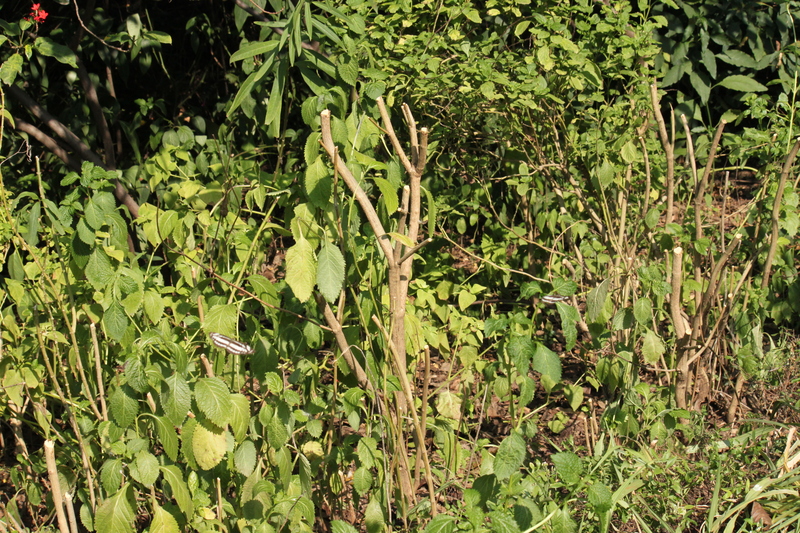 The nurturing net enclosures where caterpillars were supposed to be reared were all in tatters, and the garden itself was completely overgrown with butterfly-loving lantana and towering milkweed. Overgrowth doesn’t bother the flying insects, in fact they seemed happier and buzzier as there were more places to hide in the towering bushes. But a human gardener, though pleased on behalf of the arriving lepidopterans, can only feel a sense of impending doom. Overgrowth in a public garden is a sign that all is not well. Decay attracts busy politicians who will want to use this neglect as an excuse to make it over, not with new plantings, but suffocating concrete. Randomly cut overgrowth with a couple of common sailors flying around in the sun as foreground attractions. A closer look at the common sailor. The paths remained walkable, but just about. A man—his hair plastered over with cooling henna paste—and a woman, we assumed to be caretakers told us the city was planning to build a planetarium at the site. Being a star geek, I am all for planetariums, except when municipal authorities decide to put it up on land meant for butterfly and bird inhabitants. Pune is all weedy concrete jungle and relentless eroding cement dust now, its trees are fast disappearing, chopped down to make way for unplanned buildings and wider roads. 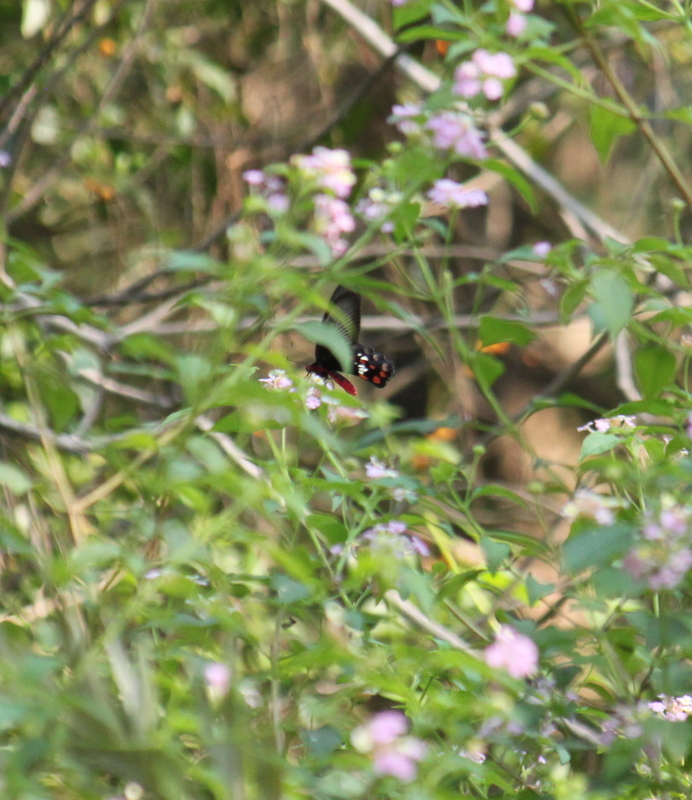 As for birds and butterflies, the businessmen politicians are not interested in their welfare or in the fragile eco-system of the hills surrounding the city. They are in fact, looking for ways, to pull back existing laws meant to protect the bio-diverse hills, as the fastest way to make a buck through their builder friends who will pour their favourite cement mix all over the city’s hill lungs. A common rose taking full advantage of the overgrowth, its striking vivid reds playing hard to get with my camera lens. Inside one of the tattered enclosures was what I think is a glassy tiger feeding away quietly not too bothered by my heavy footfalls. I could be guilty of romanticising our problems. 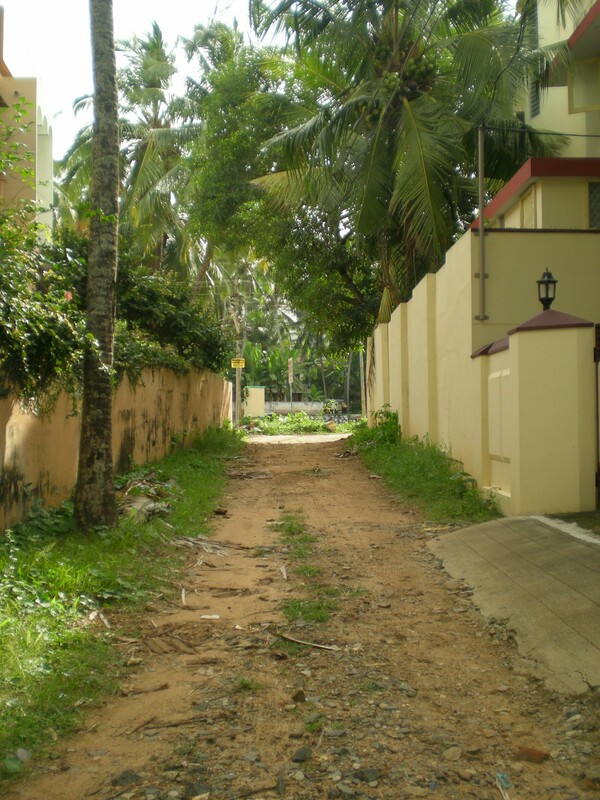 Once there were green spaces in the heart of the city where mostly the upper castes and the rich lived in beautiful bungalows with attached gardens. Now this is being replaced with terribly ugly, clustering, crowded overpriced flats in multi-storied buildings with basement parking and no verges or gardens. 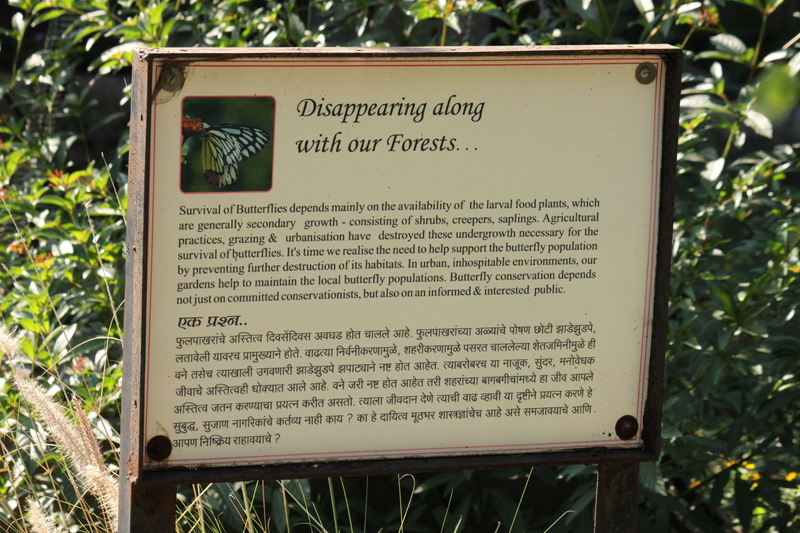 After the last few gardens vanish, where will the butterflies go? They will disperse through the city into its remaining dust-caked trees and weeds sprouting through cracks in the urban sprawl. I see some of them everyday scurrying through traffic in between the marauding hordes of automatic scooters, taking shelter at dusk in stairwells alongside distant moth relatives. Their fate is our fate. This is no country for butterflies. 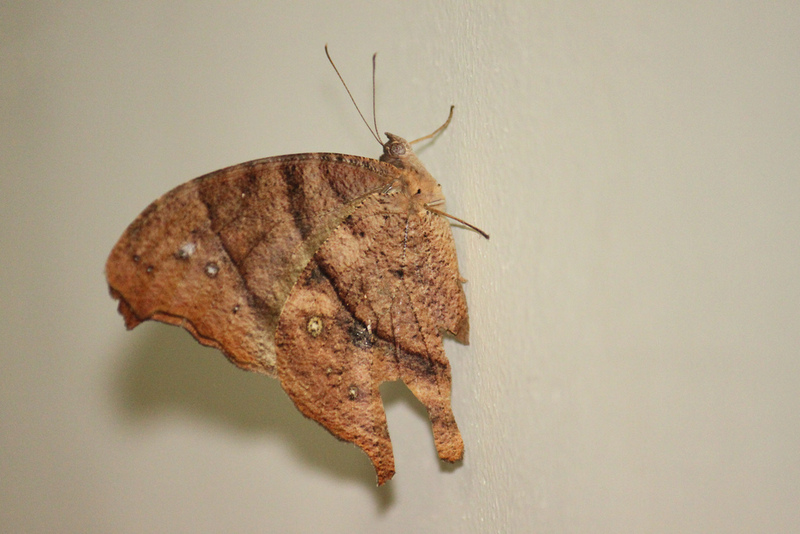 A common evening brown taking shelter in our building’s stairwell. This one is brilliantly camouflaged when it comes to rest on a forest floor carpeted by fallen brown leaves. 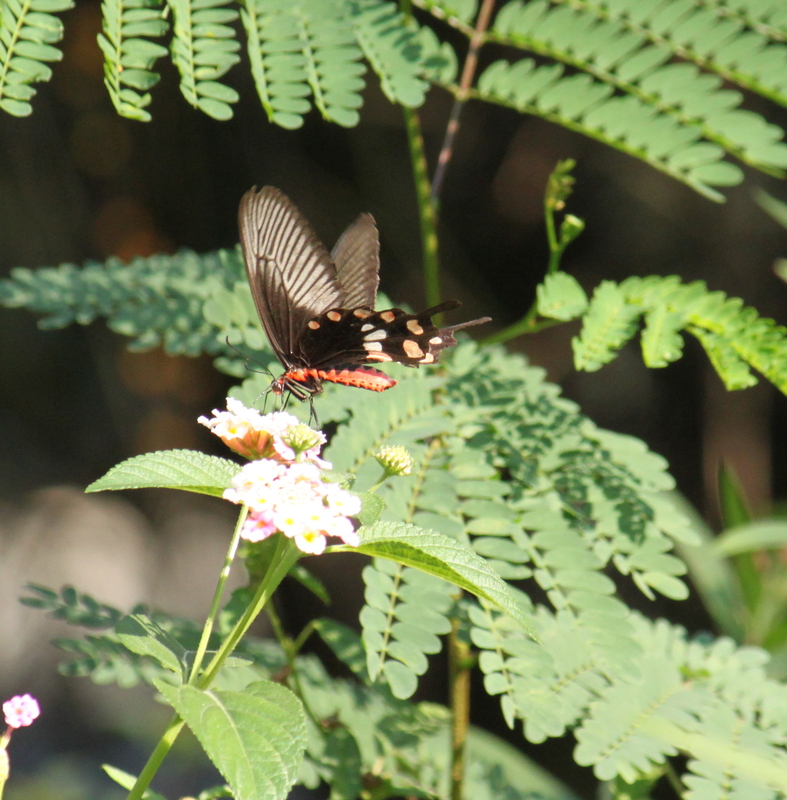 This is the butterfly I see flitting gamely between scooters on our fast roads. Here is a common rose, my lens not doing justice to its beauty, feeding on a butterfly favourite ‘lantana’. 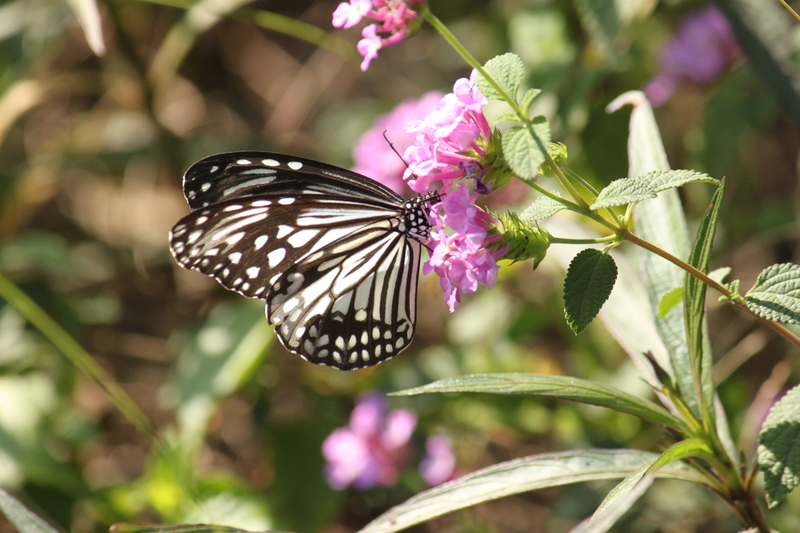 If you are lucky enough to have a garden, please do plant flowers that butterflies love. I couldn’t find this sign on my last visit. But here is a picture from one of my previous visits. A list of some plants popular with our flying jewels. Most probably a common emigrant butterfly identifiable because of this lovely lime green. 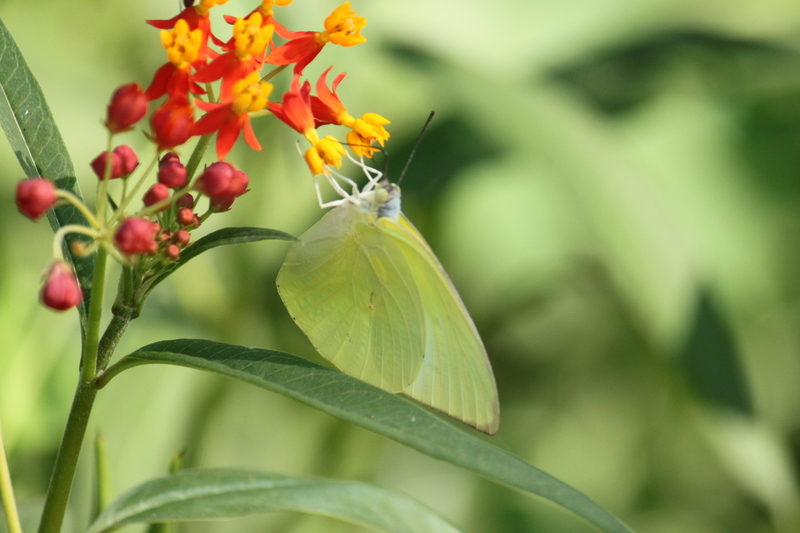 Here it is feeding on another butterfly favourite Asclepias or butterfly weed or blood flower. 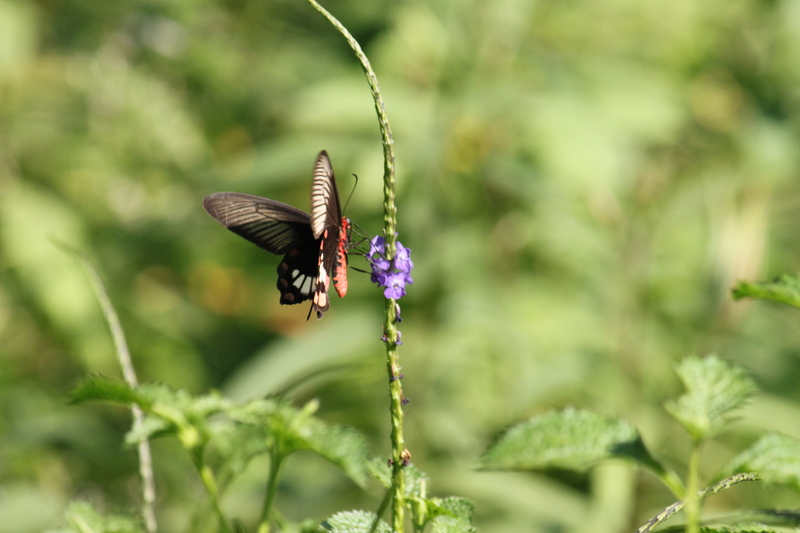 A common rose feeding on a Jamaican Bluespike. If you are interested in Indian wildflowers, please get Common Indian Wildflowers by Isaac Kehimkar. 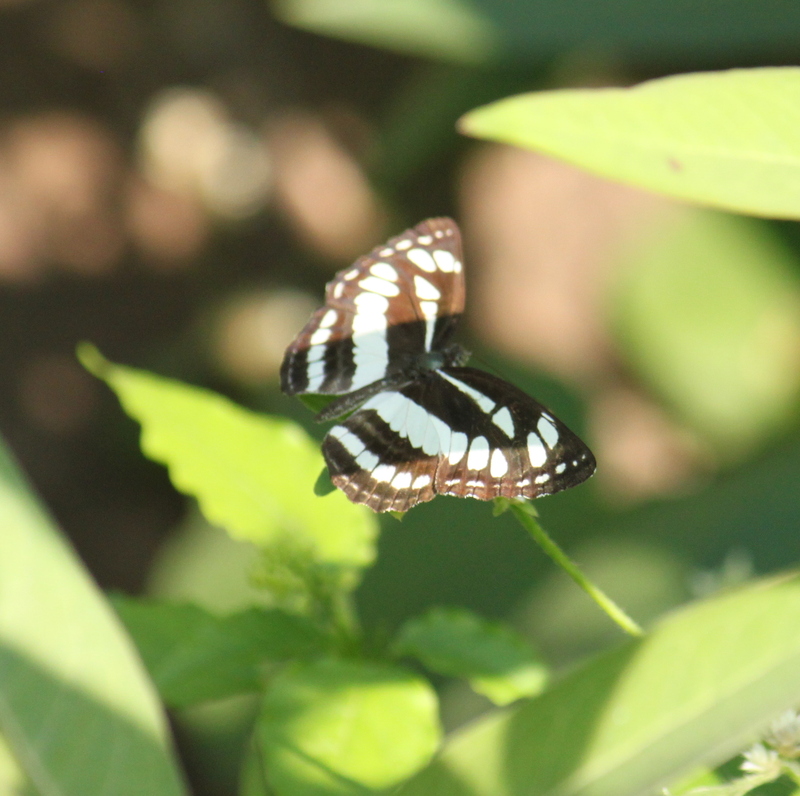 He has also written The Book of Indian Butterflies. 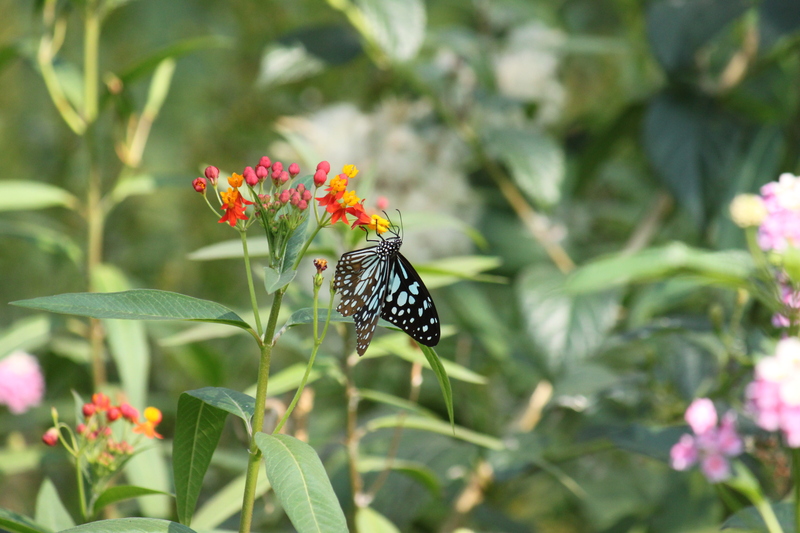 A sky-blue-striped milkweed butterfly _ introducing the blue tiger. They are very common, but I can never get enough of them. 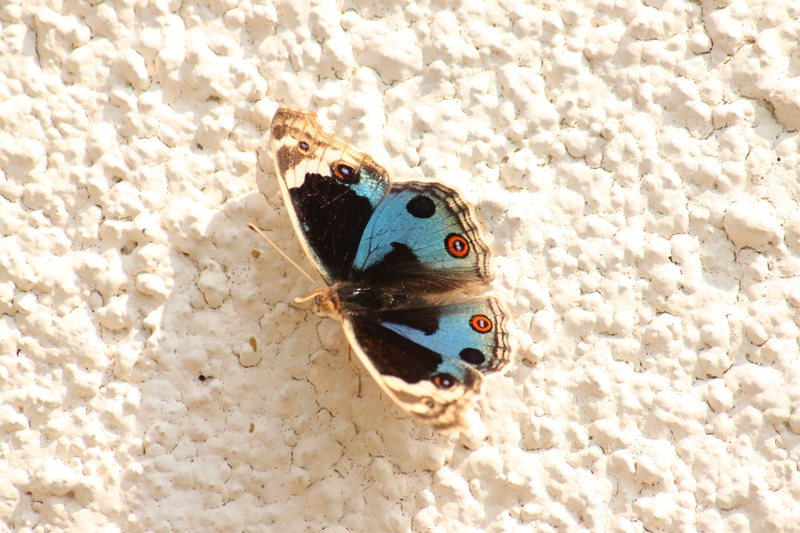 A rare surprise visit from a blue pansy to my fifth floor balcony. Just look at those soul blues, how can we not make space for them in our cities?